In a push to prevent tobacco and e-cigarette companies from targeting youth and minorities, the Contra Costa County Board of Supervisors is considering adopting a slew of provisions that restrict the sale of flavored tobacco products and electronic and menthol cigarettes. The board did not reach a consensus on several provisions presented to them by county health staff during a lengthy public hearing on Tuesday, but supervisors unanimously agreed that more regulations in the county are needed. It is likely that the board will take steps to restrict sales in July. Several cities in the Bay Area have already adopted or are considering bans on menthol and flavored tobacco products, which studies show disproportionately target communities of color and children. Oakland is currently considering one, as is San Francisco. A ban was considered in San Leandro earlier this month but ultimately rejected. The issue in Contra Costa is not whether the county should adopt a ban. Rather, it is how far an eventual ban should go in limiting sales. The board considered banning sales of menthol cigarettes at stores located 500 feet or 1,000 feet from a school, playground, park or library. There was also discussion on whether vape products should be included in the eventual ban. A point of contention presented itself when supervisors discussed the possibility of banning pharmacies in unincorporated areas from selling tobacco products, a provision that only Supervisor Karen Mitchoff opposed. A ban on flavored products, such as cigarillos that come in cherry and watermelon flavors, appeared to have unanimous support, though there was no official vote during the public hearing. “There are some things that I’m absolutely supportive of, and others where I think we need to take an incremental approach because we’re balancing the impact on youth versus the rights of adults to make decisions for themselves,” said Supervisor Candace Andersen. Mitchoff, especially, seemed reluctant to pass some of the more stringent provisions of the smoking ordinance — including outlawing vapor and hookah lounges and some dedicated smoke shops in the unincorporated county — until more research has been conducted. She said she feared that passing the weighty ordinance without additional studies would open the county up to litigation, a threat that was made to leaders several times from tobacco and electronic cigarette advocates. 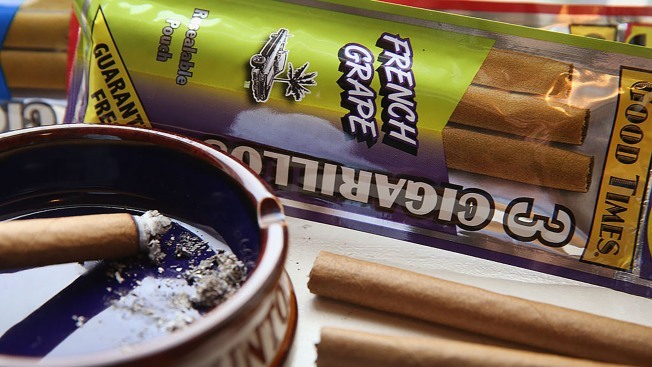 Block and other tobacco proponents attempted to frame the ban as an infringement on personal freedom, and claimed that banning menthol and flavored tobacco would result in an underground black market and contribute to more crime. A ban on menthols is not unprecedented in the Bay Area. The City of Berkeley already bans menthol cigarette sales within 600 feet from schools, a policy that was adopted after a nationwide study found that youth who smoke menthol-flavored cigarettes are significantly more likely to show signs of addiction. The same study also found that communities of color are targeted more aggressively with menthol cigarette advertisements than white counterparts. And, while smoking across the United States is on the decline, menthol cigarette sales have increased steadily, according to several reports. The flavored tobacco ban stems from studies that show that the cheap and brightly-colored packages of some cigarillos attract children. Sales of Swisher Sweets and “blunt wraps,” which come in flavors like watermelon and cherry, have increased steadily in youth populations. Cristina Rodriguez, who came to support the ban, was disappointed that the board did not adopt the ordinance on Tuesday.